This book contains the quintessence of my readings in Urdu poetry which began over half a century back in my student days and continue to enthral and enlighten my mind even in old age. My long experience as a teacher of English at the university level has enlarged my area of acquaintance with poetry. 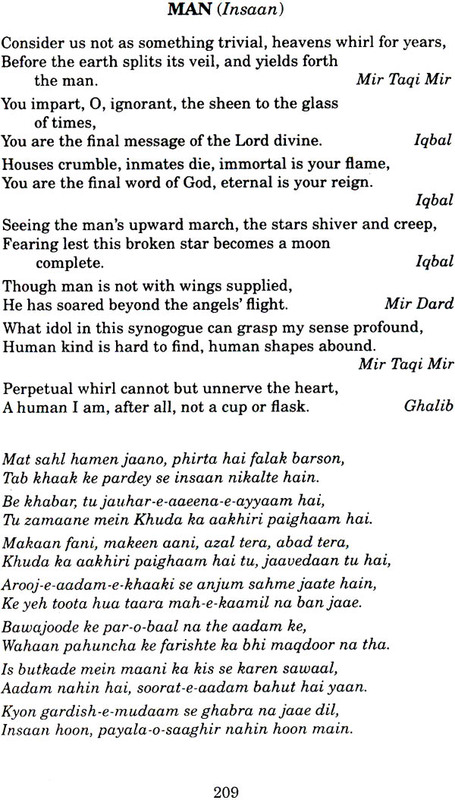 It has also sharpened my powers of literary appreciation and comparative assessment, on the basis of which I can confidently state that the best of Urdu poetry, especially the ghazal, nurtured by such masterminds as Mir, Ghalib, Iqbal, or Faiz, is worthy to share the crown of excellence with the best of English poetry, infect, with any poetry. To authenticate my claim, I present in the following pages a collection of nearly 1400 couplets selected from the works of over one hundred poets, classical and modern. These couplets, arranged subject-wise, have been translated into English and transliterated in the Roman script. The purpose of this book is to preserve the wealth of Urdu poetry, and make it accessible to a larger section of the readers, including, especially, those lovers of poetry who are not familiar with Urdu in the Persian script. I owe special thanks to Dr J.S. Neki, Justice HR. Khanna and Dr Gopi Chand Narang who have been a constant source of encouragement behind all my literary endeavours. Sincere thanks are also due to Mr Nazar Burney of Jamia Milia library, and to Mr Parkash Chandra, a veteran journalist, for helping me with books and advice during the compilation of this volume. I must also record my sense of loving gratitude to my wife, Mrs Sneh Lata Kanda, and to my son, Dr Arun Kanda, who gave me valuable help in the editing and proof-reading of the manuscript. Lastly, I offer my hearty thanks to Mr S.K. Ghai of the Sterling Publishers, New Delhi, without whose cooperation and personal interest this book could not have seen the light of day. 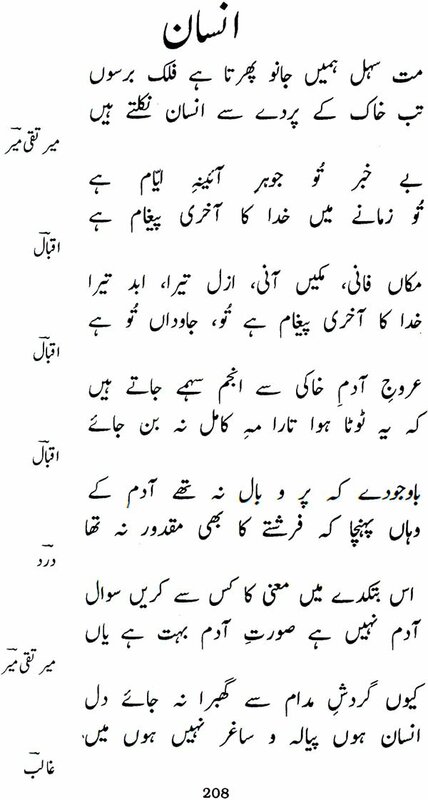 Urdu poetry is richly quotable. The ghazal, which is by far the most popular art form in Urdu poetry, is a string of thought- provoking couplets on varied themes of permanent human interest such as love and beauty, God and man, life and death, morality, mysticism, etc. The couplets of a ghazal, bound together by the unity of mood, metre and rhyme, do not generally observe the unity of thought and theme. More often than not, each couplet of the ghazal is an independent unit, detachable and self-sufficient. The fragmentary thought- structure of the ghazal which might seem a fault to those readers who look for the logical development of an idea in a poem, is, in fact, its special merit which enhances the quotable potential of the couplets. Each couplet may be called a capsule of concentrated wisdom, charged with the magnetism of poetry. The thematic variety found in the several couplets of the ghazal widens the reader’s scope of selection, so that he can pick and choose hic favourite couplets, treasure them in his memory, and return to them at leisure for thoughtful contemplation and quotation. No wonder that a bulk of the couplets presented in this book have their source in the ghazals of eminent Urdu poets, representing the whole range of Urdu poetry, beginning with the early masters, such as Wali Deccany and Siraj Auranagabadi, drawing, enroute, on the works of the all-time classics like Mir Dard, Mir Taqi Mir, Zauq, Momin and Ghalib, and coming down, via Dagh, Hali, lqbal and Hasrat Mohani, to the twentieth century masters: Faiz, Firaq, Sahir, Nasir Kazmi, Parveen Shakir and many others. There are about 1400 couplets, collected under S9 important heads, transcribed in Roman script, and translated into simple, rhythmical English, using, quite often, the ornaments of rhyme or assonance to enhance their aesthetic appeal. It is a truism to say that great poetry transcends the limits of time and clime. This is because poetry deals with the fundamentals of human thought and emotion, with permanent primary affections, though each poet invests his thought with his own authentic voice and vision. It is interesting to observe how different poets, separated by time and milieu treat same essential themes use an almost similar imagery and yet strike a distinctly individual note in their compositions hers is wali (1667-1707) one of the earliest architects of Urdu poetry, Paying his tribute to the beauty of his beloved.